Photo Books - the old fashioned way with new technology! 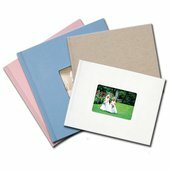 Photo Books are a great way to take advantage of today's digital photo and printing technology to create something special and lasting with your memories.Whether you're looking to create a series of family photo albums, a unique gift for a special occasion (wedding, baby, anniversary, graduation, etc.) or are a professional photographer looking to showcase your work, the limits are only your imagination. • 20 pages up to max of 50, extra pages can be purchased in multiples of 2. • Printed on photo paper.